...behind a mask that seemed incapable of expressing anything, one sensed sensitivity and strength as well as a deeper level of expressivity. Small gestures, no matter how studied, expressed their awareness of their bodies and drew attention to their provocative sexuality, together conveying a new form of American naturalism. These gestures, the relaxed posture, the studied inarticulateness, a calculated detachment, a certain angle of descent, merge with elements of the cool, a powerful metaphor for twentieth-century life. John Szwed, So What: The Life of Miles Davis. I was changing my attitude about a lot of things, like the look of my wardrobe. I was working all these clubs where there was a lot of smoke, and it would get in the fabric of my suits. Plus, everyone was starting to dress a little looser at concerts, at least the rock musicians were, and that might have affected me. Everybody was into blackness, you know, the black consciousness movement, and so a lot of African and Indian fabrics were being worn. I started wearing African dashikis and robes and looser clothing plus a lot of Indian tops by a guy named Hernando, who was from Argentina and who had a place in Greenwich Village. That’s where Jimi Hendrix bought most of his clothes. So I started buying wraparound Indian shirts from him, patch suede pants from a black designer named Steven Burrows, and shoes from a place in London called Chelsea Cobblers…I had moved away from the cool Brooks Brothers look and into this other thing, which for me was more what was happening with the times. I found I could move around on the stage much better. I wanted to move on stage, play in different places, because there are areas on stage where the music and sound are much better than other places. I was starting to explore for those places. Miles Davis. Autobiography of Miles Davis with Quincy Troupe. Before his performance, Mr. Davis will wear a single-breasted (one button) beige pongee suit, combining the French and Italian influence on pants and jacket. When Mr. Davis is playing on stage, he will be wearing a double-breasted gray imported silk (two buttons) featuring only two pockets to create an extra slim line. After his performance, Miles will relax in a pink, single-breasted seersucker jacket with matching pants, hand-made loafers of doeskin, and white sports shirt worn with a pink silk square. Press release for Randall Island Jazz Festival, 1961. I wish I had a photo of Davis from the Randall Island Jazz Festival. The details of the top center photo are notable: the way the scarf is tied, the wide leather bracelet, the woven belt, and the snake-leather pants. 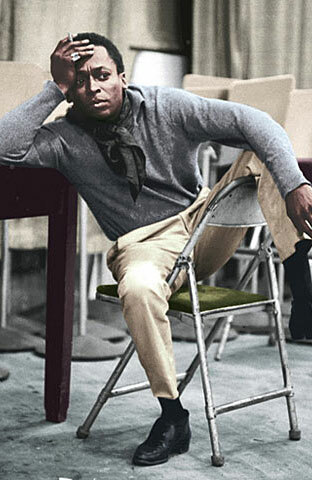 Miles Davis has long been hailed as a fashion icon. The creator of Birth of the Cool has been placed on innumerable Fashion Hall of Fame lists. His style has ranged from Brooks Brothers prep to African-inspired dress. In April 1961 GQ chose Davis as “Fashion Personality of the Month; Esquire named Davis one the best dressed men in America in 1960. No one played the trumpet like him, no one embodied cool with such throwaway ease. Listen to some of his classic pieces. 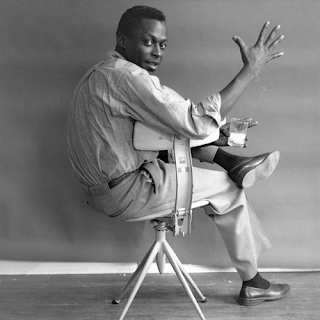 i would like to purchase the photo of miles davis A hymn to Intellectual Beauty.